Empower your vape shop with a POS that streamlines operations, organizes, and monitors the stock. Vape shops are somewhat unique when it comes to POS requirements. For the best results, it is advisable to get a solution that is specifically designed for a vape shop or an e-cig lounge. The right system is the one that combats such vape shop challenges as a diverse and complex inventory, organized order management, effective customer relations management, and marketing. Additionally, the right system should make it easier for you to manage the shop and process customer payments. When shopping for one, you should consider such aspects as a preloaded vape database, flexibility, ease of use and payment processing policy. Reviewed below are the top four POS systems for a vape shop. As your business grows, you will find it increasingly difficult to carry out some of the daily tasks like ringing up sales, accounting, and employee management manually. 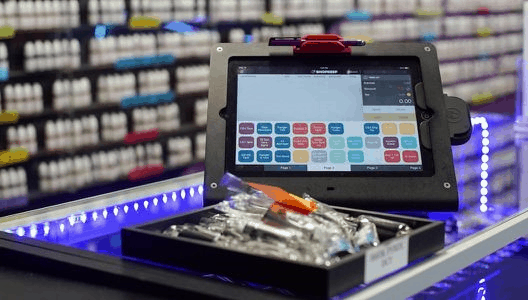 This iPad POS system is essentially designed to automate daily vape shop chores. Additionally, ShopKeep features the right tools and capabilities to optimize profitability in a vape shop. Just like the LightSpeed POS system reviewed above, ShopKeep features a powerful, scalable and customizable inventory manager. In addition to having a large number of SKUs, the system is capable of tracking every inventory item automatically. For the business to grow and flourish, you need to make sound business decisions as well. In this regard, Shopkeep is equipped with in-depth analytic tools. Basically, the system will collect business data and generate the right insights and reports. These are meant to help you understand your business better and make the right decisions. Without the right tools and technology, daily tasks like employee and inventory management, accounting and ringing sales can be challenging and time-consuming. In order to save you time and boost accuracy, ShopKeep vape shop POS system automates most of these tasks. This gives you more free time to focus on other aspects of the business. The provider also ensures that you can monitor your business in real time, through the app, on your day offs. Customization is the other thing vape shop owners love about this solution. In addition to an intuitive interface, the POS features color coding and is capable of categorizing inventory items in whichever way you desire. This enhanced flexibility allows you to optimize the screen, hence minimize confusions and improve speed. ShopKeep customer support is not dependable. Initially, customer support is prompt--especially during setup. Thereafter, you may have to wait for very long periods to get a response. Over the years, Lightspeed has been tested and proven to be one of the best POS systems for a vape shop. Not only is the solution packed with a horde of industry-specific features and capabilities, but also offers you a 14-day free trial. The system is currently being used by more than 1,000 vape stores and e-cig lounges across the country. Inventory management is one of the key challenges in vape shops. Lightspeed is specifically designed to make inventory management, stock-taking, and order processing in vape shops easier. In order to streamline the inventory, the system allows you to group similar items together. This solution is also capable of sorting e-juices according to their potency, flavor, and volume. Such aspects will ensure that you have an easy time when compiling your database for the first time. Again, this organization will make it easier for your employees to ring up sales. Many of the current users of the system also love the fact that it is highly scalable. In this regard, Lightspeed offers unlimited stock keeping units (SKUs). This has been proven to offer vape shop customers more flexibility. It also means that you can sell as many vaping devices as well as e-juice volumes and flavors as you desire. These may prove to be the competitive advantage you need to succeed in this industry. Customer experience is one of the things that will determine whether your customers keep coming back or not. Lightspeed allows you to customize your offering in accordance with each customer's preferences. Some of the capabilities you will come to like, in this regard, include the ability to tang items according to product types or brand and make custom recommendations. With the tag feature, you can conveniently group items that are often purchased together. For instance, you may offer customers vape kits or accessories, based on their needs. As you will come to learn, this personalized service helps drive more sales. The monthly software subscription fees for this system is comparatively low. However, it is only billed annually. This may prove to be too expensive for startup and small vape shops. Business growth is something that every startup or small vape shop owner desires for his or her business. Vend POS System has the right tools to scale up your business, keep the customers coming back, and manage the inventory more effectively. You will also find this solution to be versatile and easy-to-use. A considerable number of iPad POS systems only work when connected to the internet. As opposed to such systems, Vend features an offline mode. This being the case, you do not need to worry about internet outages. Whenever you are offline, the system will process transactions and automatically resync them to the cloud when a connection is restored. Did you know that increasing the number of return customers in your business can boost profitability? This is why you need to invest in a system that makes your customers want to buy from your shop again. In this regard, Vend makes it easy for you to establish relationships with your customers and offer personalized services. The system is essentially designed to capture and store such customer details as preferences and last purchases. With such details, you will be able to customize your offering to meet their requirements. Additionally, the system features an integrated loyalty program. When used properly, the loyalty program can serve as an incentive for your customers to buy from your shop over and over again. The inventory manager on this point of sale system is flexible and easy-to-use. This feature is built to handle a vast array of vaping equipment and e-juices. With this system, you'll find it easier to edit, add or remove inventory items. This system also features reliable reporting and alerts. Such tools are meant to ensure that you have the right amounts of the right stock. This way, you'll be in a better position to sell more of the best-selling vape products. With Vend, you may be required to incur additional costs in order to get priority customer support services. A simple, easy to use, and intuitive interface is not the only thing that makes eHopper one of the best vape shop POS systems. Ranging from customer and employee management to processing transactions, the system is loaded with a horde of industry-specific features and tools. Processing payments and billing customers in a vape shop has never been easier than it is with the eHopper POS system. While ringing up sales, the system allows you to either use a scanner or bring up the sale items manually. Again, the software allows you to edit sizes and quantities for each sale. You will also like the fact that eHopper payments processing supports multi tender payment options, including Apple Pay. For the purpose of security, this system is EMV compliant. All in all, ringing up sales with eHopper is going to be easier and faster to avoid long lines. To begin with, the system is compatible with both Windows and Android platforms and with a vast array of devices. Additionally eHopper makes it easier for you to track and manage customer orders in the store and over the cloud. The system makes it more convenient for you to accept orders and organize them. The feature also allows you to outline details of each order using notes. You will also be able to track each of the orders in your store until it is fulfilled. The system can only generate a limited number of reports. Additionally, the free plan of the software does not include customer support. Vaping is comparatively trendier and healthier than smoking. As appealing as the practice may be, a vape shop is a business like any other. This being the case, you need to stock the right products, know your customers and most importantly, manage the business more effectively. For you to do this properly and effortlessly, you need to invest in the best POS system for a vape shop. So, do you know which system is best suited for your business? A vape shop needs a solution that offers industry-specific features. As compared to other types of businesses, a vape shop inventory is much more complicated. For instance, the right system should take into account the availability of various juices, flavors, nicotine levels, and brands. This is actually one of the reasons you need to invest in a system that is specifically meant for a vape shop. In addition to monitoring and alerting you of stock levels, inventory management on your preferred solution should be able to organize products with various arrangements/ variants. In some of the leading POS systems, the inventory manager comes preloaded with hundreds of juice variants, brands, and flavors. This will save you time as you do not have to compile your inventory database from scratch. Other systems also feature preloaded images for the various products in the database. This makes it even easier for you and the customers to identify the products. The best vape shop POS inventory manager should allow you to add your own products to the database as well. The system should also make it easier for you to enter the products that are not already on the database. The right solution should be capable of accommodating other vape-related products, in addition to juices. For instance, some of the best systems will also allow you to enter such products as coils, chargers, and batteries to the database. One of the things you should consider on payment processing is the policy your provider has on vaping. For instance, Fast Data is associated with Wells Fargo—a company that is not friendly to vape shops. Such a payment processor may or may not support vape-related transactions. In order to ascertain this, you should check the provider's payment processing policy. Secondly, you need to consider the processing fees charged by your preferred provider. In this regard, you have to choose one of the three main pricing options, including flat-rate processing, interchange-plus, and tiered pricing. Depending on the size of your business, you need to choose a payment processing rate that is both convenient and friendly. While some point of sale systems have everything you need for a vape shop, they are known to be bulky and cumbersome to use. Whichever way you look at it, such a system is not suited for your business; it will only waste more of your time every time you ring a sale. Instead, it is advisable to go for a system that features an innovative user interface. Basically, vape shop POS systems that have a touchscreen are relatively easier to use. Additionally, the system should have a menu layout that features product images. Such aspects will make it easier for you to click on the desires items every time you are entering an order into the system. Do you have employees in your vape shop? If so, you need to manage them in a better way in order to maximize their productivity. This can be easier and more effective with the right employee management software. As such, you should consider getting a system that features the best employee management tools. For instance, your employees should be able to create their profiles in the system for the purpose of clocking their hours. The system should also allow you to assign different levels of access to the employees, based on their roles and responsibilities. The best vape shop POS system should also help you evaluate employee performance and create a work schedule. In such a case, it will be easier to assign the best performing employees to the busiest business hours. This will boost the overall productivity of the business in the long run. At the end of the day, the success of your business will depend on the number of customers you have and how often each buys from your shop. This is precisely why you need to relate well with your customers and engage them more effectively. This is now possible with the right vape shop POS CRM features. The leading systems today are designed to collect customer information automatically at checkout. With such information, you will get to know your customers in a better way, hence be able to engage them more effectively. Using each of the customer's purchase history on your POS system, you will be able to create custom promotions for each one of them. You may then use their email addresses, stored in the POS system to send the customers such promotions. Over the years, this has been helping vape shops attract and retain customers. In addition to having diverse and complex inventory managers, the four POS systems are packed with a range of industry-specific tools. These solutions are specifically designed for enhanced flexibility, streamlined operations, ease-of-use and peace of mind. All in all, this guide has the considerations and well as recommendations you need to choose the best vape shop POS system.